Guide to affordable adventures and free scenic camping locations in New Mexico. 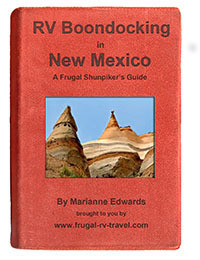 <br><br> For RV boondocking and tent camping, hiking, and backpacking. Easy-to-follow directions, including GPS co-ordinates to 80 frugal (usually free) camping locations that we personally used near the most popular (and lesser-known but waiting for you to discover them) destinations in New Mexico. Almost all of the 80 suggested frugal and "camp-for-free" areas listed in this guide are suitable for tents as well as RVs. A complete camping accessibility index will tell you whether a tent can be set up at each campsite. The same index suggests what size of RV can most easily access the sites. Detailed directions to every suggested attraction and campsite. A New Mexico map shows the suggested routes and where to camp for free along each route. Easy Referencing: The book is divided into color-coded sections corresponding to the 5 different geographical areas shown on the map. A full index at the back of the book is also a helpful tool. A detailed one-month itinerary covers the most popular New Mexico destinations. Follow it, see all the major attractions, and spend less than $100.00 in camping fees for the entire month! Tips on what to see, where to camp, where to shop, where to eat, where to find free water, free RV dump stations, propane, showers, wi-fi Internet, and more. Hiking suggestions.We love to hike so we've listed some of our favorite New Mexico hikes.